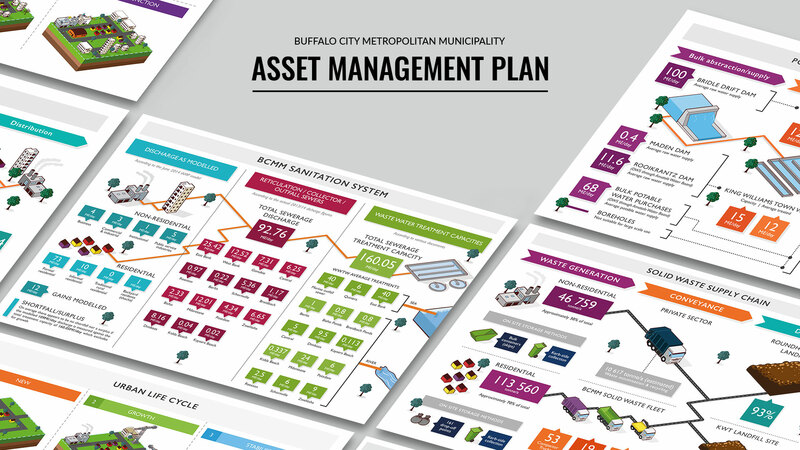 Buffalo City Metropolitan Municipality commissioned the creation of their Asset Management Plan. Among other design and creative deliverables, Geolix illustrated a series of infographics and schematics to demonstrate various aspects of the complex field of asset management. Under the expert guidance of i@ Consulting, we produced vibrant and distinct visuals to communicate large volumes of information in a digestible format. The final outcome consisted of detailed illustrations and figures of electricity networks, potable water systems, sanitation and solid waste, to name a few.